There haven’t been any recent attempts that I’m aware of, but I know it’s true. 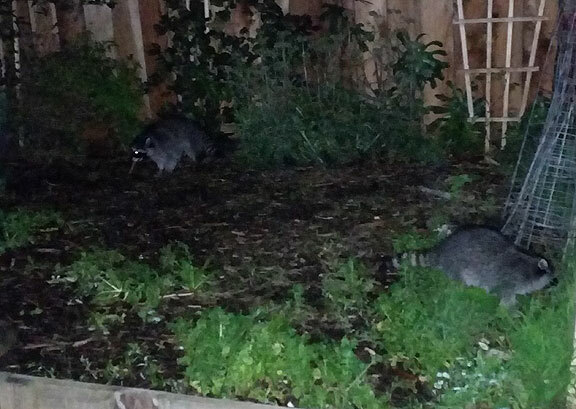 We had some very rambunctious raccoons rolling around our backyard during the Posada on December 17,and they were utterly unafraid of the dozen humans standing a few steps away. But they made no move to attack. It’s actually a standing joke among my friends. 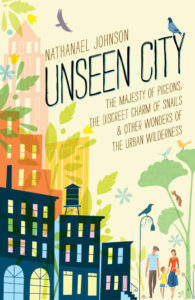 I write and talk a lot about ecology and transforming urban life to harmonize with natural systems. I’m very concerned about climate change and probably pay more attention to the cascading bad news than most people I know. And yet I hate camping (dishwashing in the woods as far as I’m concerned). People and their pets (especially dogs) drive me crazy—I hate how people anthropomorphize their animals and then treat them like children. I eat meat with enthusiasm, and find proponents of animal rights and/or veganism too often some of the most pedantic, moralistic, and generally unhappy and unpleasant people I’ve met (with some exceptions, happily). In spite of being an inveterate urbanite who feels safer sitting in a parking lot than next to a babbling brook buzzing with insects and birds, I think about nature and ecology a lot. Lately I’ve been reading a lot too, and I’ll be quoting from five different books during this post. It’s been a bit like taking a quick class in urban ecology, though the books covered here aren’t quite that focused. 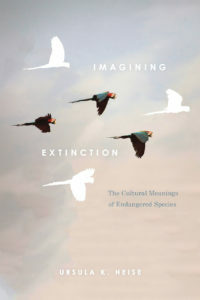 From the most philosophically minded, Imagining Extinction: The Cultural Meanings of Endangered Species (by Ursula K. Heise, University of Chicago Press: 2016), to the most down-to-city-earth Unseen City: The Majesty of Pigeons, The Discreet Charm of Snails & Other Wonders of the Urban Wilderness (by Nathanael Johnson, Rodale Press, New York: 2016), the books here help us take a big step back from the panicky urgency that arose in response to the election of Trump. I understand that the Trump regime will be a wrecking ball to most of the environmental gains of the past half century. 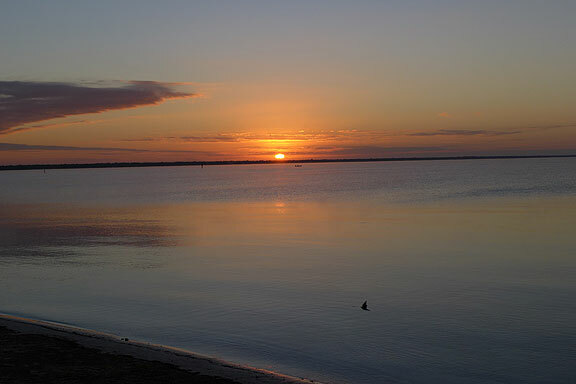 Moreover, developing a nuanced understanding of a healthy relationship between human life and nature will not only not gain traction, but whatever has been gained will likely be reversed now. But going into panic mode and rushing about without a strategy seems like a bad idea to me. The view of Mt. 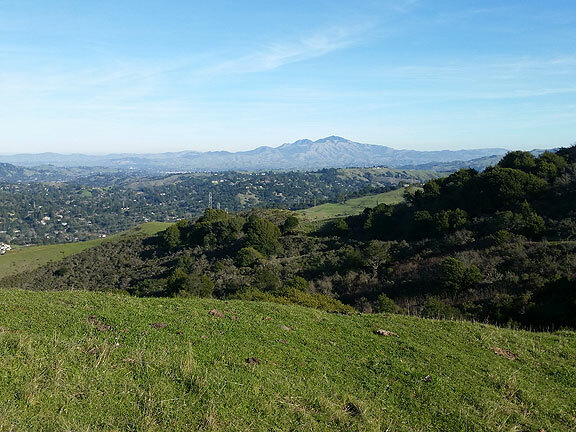 Diablo from the top of the Sibley Volcano just southeast of the Caldecott Tunnel in the east bay hills. 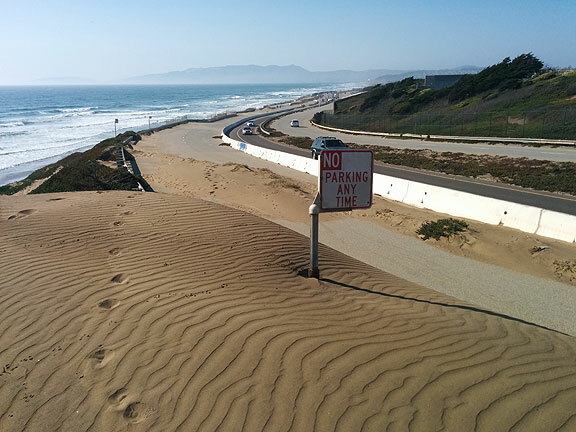 Nature having its way with infrastructure! I decided it’s a good time to think deeply about where we are and where we might go. The fraught politics of inequality built on centuries of racism, sexism and general fear and loathing of “others” is not something that doubling down on the smug self-satisfied rhetoric of coastal know-it-alls is going to adequately address. It’s hard to believe that anyone in their right mind could vote for an obvious liar and huckster like Trump. But when you pause for a moment it’s easy to see that Trump is not such a departure really, and that Americans have voted for frauds and charlatans as president almost as often as not. Something primal happens to voters, apparently, and given the chance to support a venal, hateful demagogue who promises the moon an awful lot of people say “give me the moon then,” realism be damned. 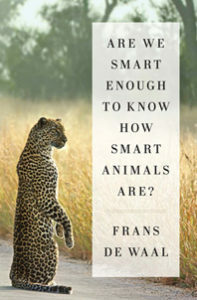 I am thankful for the time I had to read these smart books, which in addition to the two mentioned, also include Are We Smart Enough to Know How Smart Animals Are? 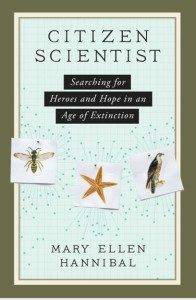 (by Frans de Waal, W.W. Norton & Company, New York: 2016), Citizen Scientist: Searching for Heroes and Hope in an Age of Extinction (by Mary Ellen Hannibal, The Experiment LLC, New York: 2016), and Satellites in the High Country (by Jason Mark, Island Press: Washington DC 2015). An earlier book I read kept looping itself back into the conversation these books had in my head, which was Feral by George Monbiot that I briefly mentioned in an earlier post. Monbiot argued in his book that we should restore apex predators into our environment to re-establish a sense of awe, fear, and excitement that we are lacking in modern life (imagine having to consider encountering a bear on the way to the corner store!). His book seeks to break with the dogmas of mainstream environmentalism, and to a great extent that is what is refreshing about all of these books too. Each of the writers in their own way is trying to rethink, reimagine, and propose a new approach to what has become an impossible cul-de-sac of environmental degradation, climate chaos, and rapidly accelerating extinction. All of the writers here have gone beyond the paradigms that beset radical environmental thinking only a generation ago, wherein humans were still largely outside of and the opposite of “nature.” All of them, in various ways, are trying to articulate new approaches to some kind of reconciliation, to finding a way that humans as natural beings can find an appropriate set of philosophical assumptions to shape new behaviors that in turn work with the logic of nature instead of being implacably against it. Her book breaks interesting ground, examining the role of archives and databases as cultural mechanisms for establishing meaning as important as science fiction, ethnography, and theories of justice. All of these are woven together in the book, producing some refreshing new ways of thinking about our predicament. 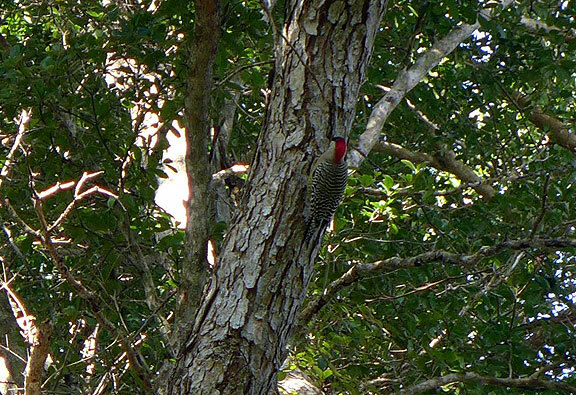 A West Indian Woodpecker, seen not far from the Bay of Pigs! If the continuity of intelligence among all living beings is a better way to understand the world, we can no longer pretend there are no ethical problems with how humans are imposing themselves on the planet—on its inhabitants, its basic systems, and even the atmosphere and the oceans at this point. We can blame capitalism for its voracious logic of growth and destruction, but we can’t escape the ethical responsibilities we’re shirking towards the rest of life while this human-made system runs roughshod over the world. Mary Ellen Hannibal’s book Citizen Scientist goes much further than its title would suggest, including an excellent history of the San Francisco-based Academy of Science, and a great deal of rumination on earlier projects that featured non-scientists doing science, notably the Ed Ricketts and John Steinbeck trip to the Sea of Cortez in the 1940s. Much of our contemporary view of nature and wild life is rooted in 19th century sensibilities, that are in turn heavily influenced by Charles Darwin and his contemporaries. Tracing the influences on Ricketts back to his time at the University of Chicago, she describes a relatively unheralded zoologist there Warder Clyde Allee and his “organismic-community concept” which emphasizes the group over the individual. Ideology is never far removed from science, in spite of all the claims over the decades of objectivity and clear-headedness. Ethics are at the heart of science, or should be, as they also ought to be at the heart of most social decision-making. Up to the present most of our ruminations on ethics have limited themselves to interactions among humans, but Heise, Mark, and Hannibal all bring forward a new kind of ethical framework to consider earthly life going forward. Perhaps the biggest and most important task before us is to recalibrate our sense of place on earth. 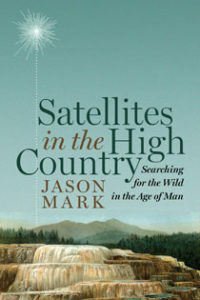 Jason Mark’s book both rejects the notion of pristine nature and urgently embraces the “wild” as the category of life we must defend and extend. Hannibal quotes in her book the famous biologist E.O. 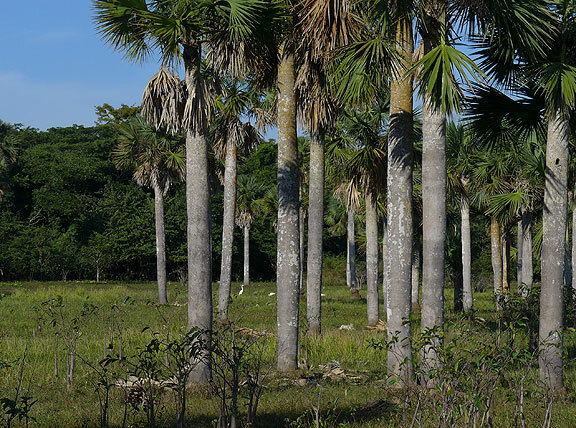 Wilson’s call for reserving 50 percent of the planet for nature without further human intervention. 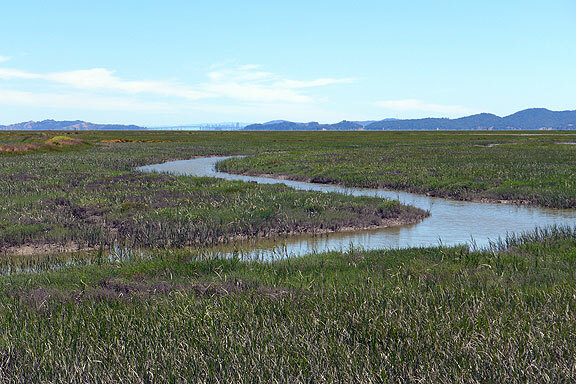 Restored wetlands on north rim of Bay, San Francisco visible in far distance. 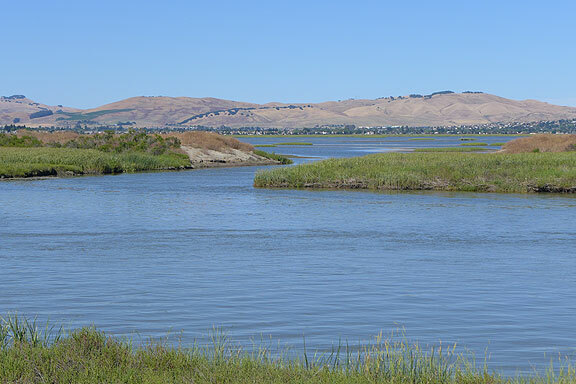 More recently restored wetlands near Vallejo. 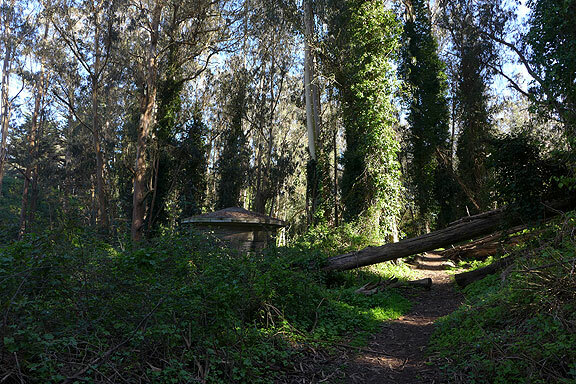 Senascent Eucalyptus forest near Laguna Honda draped in German ivy. 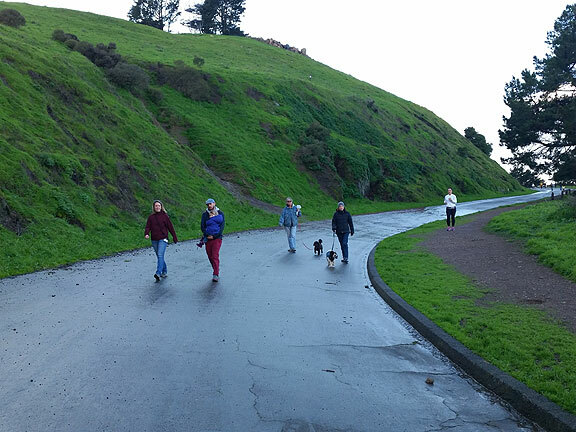 Glen Canyon, a wild spot in the heart of the City. Rewilding is a multifaceted concept that allows for more human creativity than you might think at first glance. Mary Ellen Hannibal writes beautifully about her father’s slow passing during the preparation of the book, providing a very personal experience of death to frame the abstract discussion of extinction and preservation that her book is about. When he dies near the end of her narrative, it gives her a chance to ruminate on systemic death as opposed to individual death, which is finally what we’re up against now. Four decades ago I went off to college with a burning desire to understand ethics. I suppose if it had been centuries earlier I might have opted for theological studies (though celibacy was NEVER an option!!). In some ways my time on the earth has been bookended by the early concerns I had for what would constitute an ethical society, and today’s necessary broadening to posit questions about what constitutes a new kind of multispecies ethics. 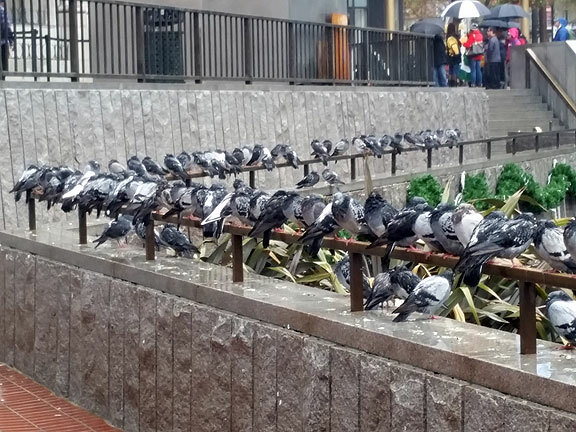 Multispecies ethnography… focuses on some of these relations to develop new descriptions of human societies. Such ecological connectedness, especially for twenty-first-century citizens shaped by material and sociocultural structures that tend to make their own dependence on ecological networks invisible, may not be immediately perceptible or experienceable any more than the social embeddedness into class or nation; indeed, probably less so because there are fewer historical precedents for conceiving of “species” as a relevant social category… On the contrary, eco-cosmopolitanism as I conceive it is shaped by an awareness that very little commonality can be taken for granted and that speaking about the human species, humanity, humanness, or the Anthropocene requires a patient and meticulous process of assembly—in its most craftsmanlike and technological connotations…. Decisions about biodiversity are in the end questions about value, about cultural frameworks of thought, and about historical traditions of social practice… The future of endangered species and of biodiversity conservation is not, in the end, just a matter of science, but also and mainly one of histories, cultures, and values. I might still believe nature is trying to kill me, but I’m definitely NOT trying to kill it! 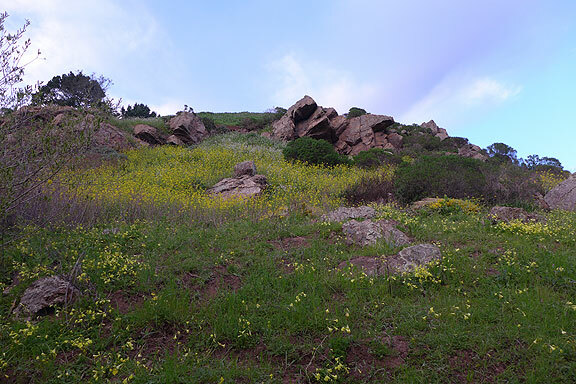 I like the idea of withdrawing from large swaths of land and re-engineering our lives in urban areas to work harmoniously with the logic of nature, to the greatest extent possible. This seems like work worth doing, with the ultimate goal of reducing how hard we work and how wasteful we are with this one-and-only home we have. We could all live a wonderful life, materially satisfied, and culturally enriched, if that were the goal and the guarantee of our shared lives. What else are we here for? Flourishing bird life in the protected wetlands to the east of the Bay of Pigs.